← 2013 New Year competition winners! Friezland Lane Working Men’s Club: help needed! 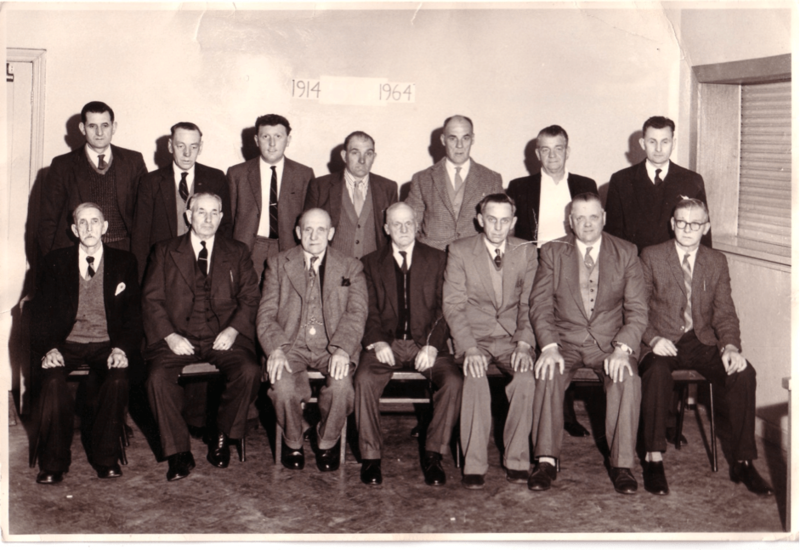 Friezeland Lane Working Men’s Club committee photo from, I’m guessing, 1964. 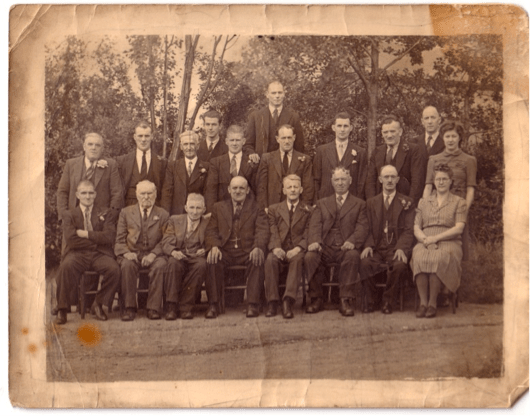 I’m keen to identify the gentlemen in the picture, as the history of this club, and others in the area, isn’t something we’ve covered enough on the Brownhills Blog. Picture kindly supplied from the Lynk family archive and scanned by David Evans. I have been asked by a family member to help them with work on a project of building a games room. It is to be based on a games room they were in along with myself as a child when we used to go with our dad to the local working mens club near our home, of which he was on the committee. Friezland lane WMC was obviously on the aforementioned road, Friezland Lane, between shire oak and coppice road. Not a single person who either went there or lived nearby has any photographs or in fact anything what so ever from the place and wondered if you or any viewers could shed light on it? Many thanks for your time, and stick with this blog friend, it’s the talk of the town, in the best sense…. Happy new year to you and all readers. Happy New Year, Ant, and thanks for the lovely words. This is an interesting question. That there [Howmuch?] – who’s a confirmed Walsall Wood Mon™ – has mentioned this many, many times. the only thing we’ve done on the blog relating to it was the history of the Pagett/Lynk family, which can be read here. There’s some great stuff in the comments from local lad Porktorta, amongst others. The Friezland Lane Club was a hub of the community. Folk drank there, played sports in teams based out of there, whole families went on huge, organised day trips from there. They had live music and entertainment most weekends. Locals held Christening parties, wedding receptions, and I daresay a few wakes, too. There must, therefore, be loads of photos of this great institution around – maybe as background to to aforementioned events. We have next to nothing about this club. It’s almost like it never existed. Similar ones, like Walsall Wood and the Wood Labour Club, are also largely absent from the photographic record. Please, people, what have you got? Both for Ant Hill and the wider community. There was a whole life here, and it seems lost to us. Let’s see what we can find. BrownhillsBob at Googlemail dot com. Cheers. 1948 image of the club committee, featuring Enoch Pagett, first row, third left. See text for link to the original post. Image from the Lynk family archive, scanned by David Evans. This entry was posted in Brownhills stuff, Environment, Fun stuff to see and do, Interesting photos, Local History, Local media, Local music, News, Reader enquiries, Shared media, Shared memories, Social Media, Walsall community, Walsall Wood stuff and tagged Ant Hill, Brownhills, Brownhills local history, club, Friezland Lane, Local History, mans, New Photos, Pubs, Redevelopment, Shire Oak, Staffordshire, Things to do, Walsall Wood, working. Bookmark the permalink. 62 Responses to Friezland Lane Working Men’s Club: help needed! Hi buddy. Did you have any luck getting info off your dad regarding friezland lane wmc? Would love to hear more about what ppl have. Regards Ant Hill. Last orders for the Working Men’s Club? i joined a troupe of child singers in 1952 called the starlets concert party- the man who organized it lived on common side his name was bert stevens-we sang at most of the clubs in the west midlands during the 1950s and raised quite a sum of money for the poor orphans in doctor barnardo`s homes, bert was himself an orphan, and worked tirelessly to organize this troupe, i sang at friezland lane club for the first time in 1952 as a boy soprano- and many times thereafter-and remember this club vividly. The last time I heard from your good self was 10 years ago when we were working together to raise money for Cancer Research UK in Aldridge. The project was called Art for Aldridge. I am now doing a book about the history of the Black Country in poetry and art. I have done all of the obligatory stuff but feel the need to do something about Aldridge. I am due to address Aldridge Local History Society next month and want to read two of your poems. is that OK? Also – *I want to dedicate some poems to you. Is that OK? You are a great wordsmith. You have moved address and don`t know where you have gone. My email address is inhenery@aol.com. Please get in touch. Thanks. i cant add to thte history of this club, but as a young kid it played a part in my life on a sat and sun night! my mother was (and at 85 still is!) a well known musician and at one time used to play for the acts there she dident drive them so we used to set out in dads car from pelsall past the jolly collier on the lichfield rd! this dates it a bit! but as was a kid id say late 60s now my mother was well known in the area so id guess she wouldent have been there if it wasent a well known venue, and she played there for at least a couple of years,i do know max wall once apeared there! ive just asked mavis! sorry my history on this is personal and mainly showbizz but i believe it was a good club in my childhood! Mr ? Curly, Jack Taylor (My Dad), ? ?, Joe Richards, Frank Owen, ? ?, Mr ? Griffiths, Mr Sarsfield (steward), Margaret Sarsfield (Stewards daughter). Eddie Richards, ? ?, Bill Armatig, Mr? Breedon, Jim Hession, ? ?, Mrs Sarsfield (stewardess). I can remember a group called Pepper Village playing there in the 1970s. as well as playing music they had a horror act at the end of the night. Seen a few people faint when he rushed in to the crowd at the end of the act. Back in the early 60s when i was a lad, i can remember going on a day trip from Friezland lane club, there were between 9 or 11 coaches which started of from out the front of the club, yes 9 or 11 coaches. And we had a free packet of Smiths crisps (with the blue packet of salt inside) and a bottle of pop. Later on i can remember going on a day trip with the same club were we caught a train at Brownhills railway station, for a trip to Blackpool. For the Licfield Mercury an odd year of 1965 has appeared. For Friezland Lane WMC there are a couple of mentions. In the Cannock Chase Snooker District A League they beat Cannock Ex Service B by 4 to 1 in January. In March there is the 4th round individual Snooker championship and listed as taking part from Friezland Lane are J Richards and M Hildrich. These is a league table after 16 games shown, if anyone is interested let Bob know. Friezland Lane WMC win Area Final…the Cannock area final of the James Cup in exciting match against Cannock Co-op Sports A played at Cheslyn Hay, six excellent frames, the final frame deciding the issue…The first two frames between K Onions and J Richards resulted in a win for Richards by 104 to 63…J Marsh for Co-op against D Bates…leaving E Joiner the last Co-op player with a 22 point lead…Hildrich however wiped out the advantage and establish a six point lead. Lichfield Mercury May 1965…Friezland Lane potted James Cup Double! …With just four colours remaining in the final frame the issue was still in doubt, but J Richards playing a remarkable shot, ran out for game and clinched the match for the “Chase” side. I have a photograph of the club taken sometime between 1922/1927. I believe the club was started by one of my great grand fathers,in the front room of the house which was next door to where the club was built.At the momment I dont know whether it was my great grand father Thomas Wood orJohn Craddock as I’m still trying to find that out. Could you please let me know how I can send you the photo over the internet. Hi, Josie I found youre photo of friezland Lane working mens club very interesting! maybe we have somthing in common ? I may have known youre family ! my email address is malcolmskyte@gmail.com regards. Sorry Jose, I seem to have my wires crossed, but hey carry on with your research, as Im sure one day youll’ know!, tomorrow may rain so, ill’ follow brownhillsbob! regards. Roger Mosedale Aldridge. IN THE EARLY 1960’s as The Sundowners Rock Group we played on the little stage in the billiard room of Friezland Lane Working Mens Cl many times, we had wonderful times there, the group then consisted of Roger Mosedale, lead guitar, Barry Peacock,bass guitar, Terence Lea, rhythm guitar, Colin Corbett, drums. I was born at what was then number 28,Friezland Lane at the old cottage, and the place then was a wonderful selection of meadow and cornfields to play in. It really was our lane and our little paradise, I’m not kidding, to us kids in the 1940’s and 50’s it was an absolute heaven to live in. I , and I’m sure all those who remember it as it was then, will agree. In one of your photographs of the club committee there is a Mr Corfield second left top and I think a Mr George Cross, first left lower. Might not be related, but im certain that bobs very own david evans had a relation named emma (or emily) corfield. Could this be connected to the mr corfield in this article? Im almost sure she drank in there. Her husband worked in the mines because I remember her having a coal board pension. I used to take her to the club when I passed my driving test along with my dad. emma corfield would be david evans’ auntie? Hi Ant. Wrong David ! Bill and Emma Corfield were my uncle and aunt. Bill is featured second from top left on one of the Committee photos from the 1960’s. Greetings to my cousins, Malcolm, Brian, Geoff. Haven’t seen them for sixty years, or more. In the 1950’s in the field across from the club, each year there was a visiting fair and all the club members and there kids at the end of the cub night, would stroll across the road and have a great time at the fair. Also, I do recall Syd Orgill and The Rain makers skiffle group playing regularly at the club. Syd , a Tommy Steele look alike, lived near the traffic lights at Ogley Hay, Brownhills, he taught me to play my first there guitar chords, C, Am, F and G. Roger Mosedale. Hello Roger, I can remember my parents taking myself and my brother and sisters to the fair over the road from Frieland Lane Club, there was a luckydip (tea chest full of sawdust) and i won a plastic horse drawn carriage. If my memory serves me right, they had a charity football match behind the the Club back in the early 60s. I can also remember the bingo nights when everything stopped for the bloody bingo. no music, no kids running around, no darts, no way any talking. You’ve started me off now, the memory’s are drifting back … my uncle Simeon Kingston and my aunt Annie were the regular pianists at the club in the 1940’s and 50’s and my dad Harold Mosedale used to captain the darts team and my mom Esther Ada Mosedale now 94, used to play in the ladies darts team. Sadly most of these wonderful people are now gone but there sons and daughters I’m sure are living nearby and probably haven’t found this website yet. Well done, I’m sure the information will come flooding in once people are aware of it. Roger Mosedale. a huge thanks to Roger, please! Here are most of the family surnames in Frieland Lane that I can recall from 1945 to 1960, perhaps, if you recognise any of them and know where they live, you could encourage them to join in and provide information about those times which were…I’ll say it again, wonderful. Surnames: Green, Coombes, Talbot, Instone, Harris, Mosedale, Nicholls, Davies, Woodings/Davies, Ball, Horton, Moseley, Preston, Whitehouse, stella?, Edwin?, Rock/Torme, Kingston, The Twins?, Richards, Wooley, Lane, Clarke, Bishop, Portsmouth, Elson, Moseley, Pinches, Anker, Old Man?, Taylor, Vale, Guest. Roger Mosedale. Hi Elaine. Would her name have been Olive? just recalled a couple more names… Kenny and Trevor twin brothers and Kenny Horobin.also Smith. Forgive me folks, one more name … Heshen. Hello sergeant Stanway, how are you? what a surprise! move to the right in threes! Got your Email will be in touch mate …got a lot of responsibility at the moment with mom being ill. Dodgeout. Do you remember the Sundowners playing at the club? On the Coronation day of our present Queen, ‘The Club’ had a fancy dress party and competition outside at the front of the club. The selection and diversity of costume was unbelievably imaginative. I recall exactly that Mr Jack Taylor won the competition as ‘Mrs Mop’. Now Mr Taylor was a tough guy and created such a laugh in that guise. Great day! Great Memory. Roger Mosedale. Hello Roger yes I do remember the sundowners remember you all played at my sisters 21st birthday party at poplar avenue Brownhills they good times . still waiting to here from you. Some of the readers and viewers must have photos and not realise. …. this place was bubbling every weekend. Ill staye close to see if anything crops up. And thanks to one and all for any light shed. Regards, Antony Hill. Hello Roger, where was Capernaum road located? “The Cape” or Capernaeum Road is located almost opposite what used to be Walsall Wood County Secondary School and curves round in a horseshoe shape into Friezland Lane. At that point it meets with Common Side and the road next to it, a junction of three roads meeting Friezland Lane. All the best, Roger. Does anyone remember the talent contests at the club – we used to play and back any budding singers – but there was always this fella ( elderly ) played the spoons and the bones – what was his name ? . Best regards to all – see ya soon Dodge. I feel the need to contribute to this discussion. My name is John Beresford. I know Friezland lane club well. I lived in commonside during those years we used to sit on the step outside the club and drink Vimto and eat Jones crisps with blue bag. Jones made crisps in salters road Walsall wood. I went to school with their daughter Eileen Jones. I have a very good photo of me and my family standing on the stage at Friezland lane club. When I can I will upload it to you. The names on your site are all familiar to me. Bob I have to say that you are doing a great job in recording Brownhills/Walsall wood history. You should have a medal as big as a boiler lid ( mom used to bath me in the boiler with the fire lit, honest). We had a party for the coronation of the queen in the field behind Friezland lane club trestles orange juice jelly etc.. I know the corfields, Taylor’s etc.. I lived in commonside and new street all my life and never knew that the cape was called capaernum road. I used to be in the frog gang up the cape with wacker beardsmore as the leader. To Roger Mosedale. Roger I can remember you. I was at that party for the coronation of our queen. Great to hear from you. Hohn, I’m sorry but Roger sadly passed away last year – a remarkable and talented man. There were quite a few posts here remembering him and his music – particularly the Sundowners. Hi, I lived in Commonside from 1958 till I married in 1976. I met my husband in Friezland Road WMC. My parents – Ted and Gladys Giles went around the club and took me with them at the weekends. I remember learning to dance the waltz, quick step etc and Bill Corfield was the entertainment secretary. I remember he used to put something on the dance floor so that our shoes slid along. I have many happy memories of my time dancing there.